With Christmas party planning in full swing, the event industry is snowed under with events, from corporate Christmas parties to large-scale festivities. When trying to sell event tickets online for your Christmas party, it’s crucial to have a simple process that is able to cut through the noise of all the Christmas related communications that customers are inundated with at this time of year. Trying to conjure that festive feeling in your event attendees? Redirecting them to an unbranded, third-party website probably isn’t going to do it. With Nutickets you are able to create a custom branded ticket shop on your own website. From there you’re finally able to put those Christmas tree decorating skills to use and design a Christmas themed shop that even Rudolph would be envious of. Why not add a tinsel graphic, or indulge your seasonal side and decorate your logo with a Santa hat? When you’re selling tickets on your own website, the possibilities are endless! Need some inspiration? 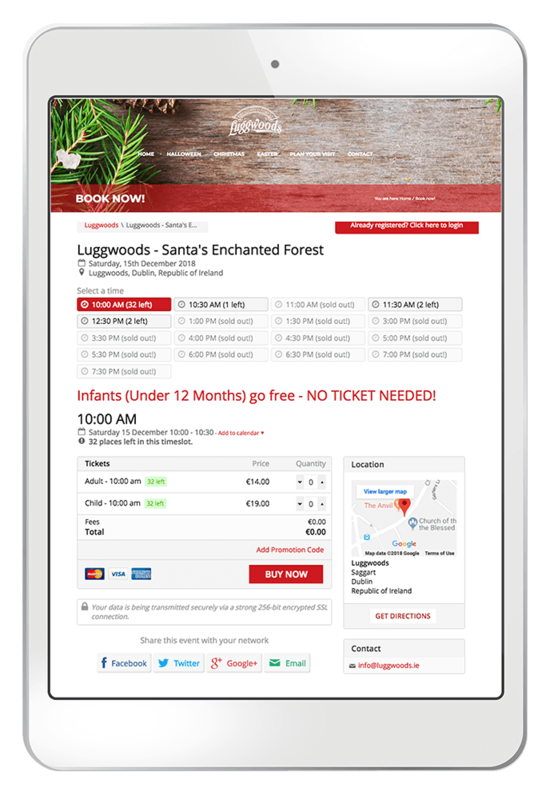 Check out Luggwoods, not only have they created a visually stunning Christmas themed online ticket shop, they provided their customers with a simple, fast process for buying tickets. Luggwoods uses the Nutickets software to allow ticket purchasers to pick their preferred date and time slot, speeding up the arrival process. This means less time spent queuing up at the gates and more time spent discovering the Enchanted Forest! Any organiser of a corporate Christmas event knows that the most challenging part of Christmas party planning is begrudgingly putting together complicated seating plans. Take the work out of reserved seating and allow the Nutickets platform to help you build a custom plan. You can block out stage areas, change the size and shape of tables, and let you celebrating guests pick their own seats or tables. Maybe you’re organising a Christmas play? 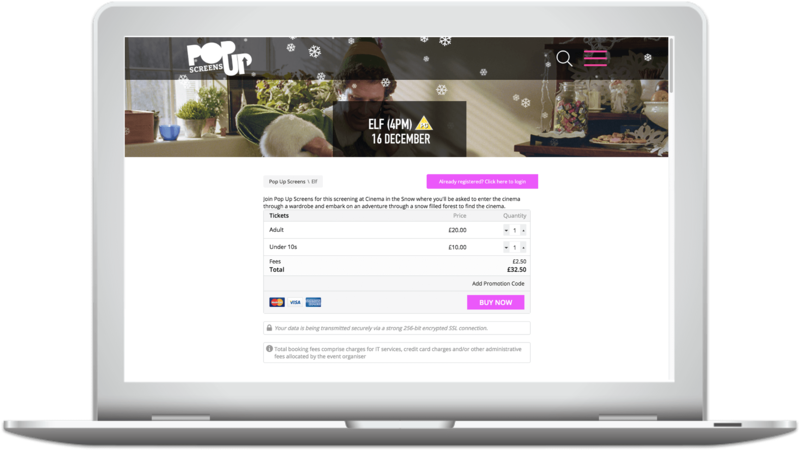 Choose tiered pricing plans for your customers to cater for all budgets - offering a lifeline to those attendees who have spent a little too much on their Christmas presents this year. Creating seating plans for festive entertainment or dinners has never been easier. Go from manual to digital when collecting your seating choices and dietary requirements. Enable guests to choose everything from their seats, to menu choices and submit their special dietary requirements online as they purchase their tickets. Let Nutickets take care of it all, while you focus on providing your guests with a simply magical experience. Give yourself the gift of data, capture and collect data from your attendees to help inform your targeting. Nutickets allows you to create custom data entry forms, ensuring you collect data during the ticket buying process, that is relevant to you and your event. Once you’ve begun to sell your Christmas event tickets online, track customer journeys and conversions with our Google Analytics extension, to see if your customers have been naughty or nice. To simplify the analytics process, the Nutickets software gives you access to your very own reporting suite, where you can track sales, measure success and identify areas for improvement. This makes next year’s Christmas party planning smarter, as you’re informed by this year’s results. So whether you are planning a local nativity play, or a full-scale Christmas festival, get in touch with a member of the team to find out how we can help with your event today!